If you’re looking for a pro-business, employee-engaging, affordable location that is well-connected to multiple modes of product transportation it doesn’t get any better than this. The Calgary Region is recognized as one of the most cost-effective places in Western North America to establish a business within the transportation and logistics industry. As an inland port, the region is a transportation hub connecting to major cities across North America. It offers the low cost and quick delivery time throughout western Canada and beyond. The QEII highway corridor is 4 short kilometres away from Southbank and the US border can be accessed 215 km to the south. Moreover, with the completion of Calgary’s ring road, major highway arteries can be easily accessed in all directions without entering Calgary’s core. Calgary’s YYC international airport hub is 58 km north. The new international terminal, including 24 new gates, opened in 2016, expanding what was already the third busiest airport in Canada and cementing YYC’s position as a major inland transportation hub. 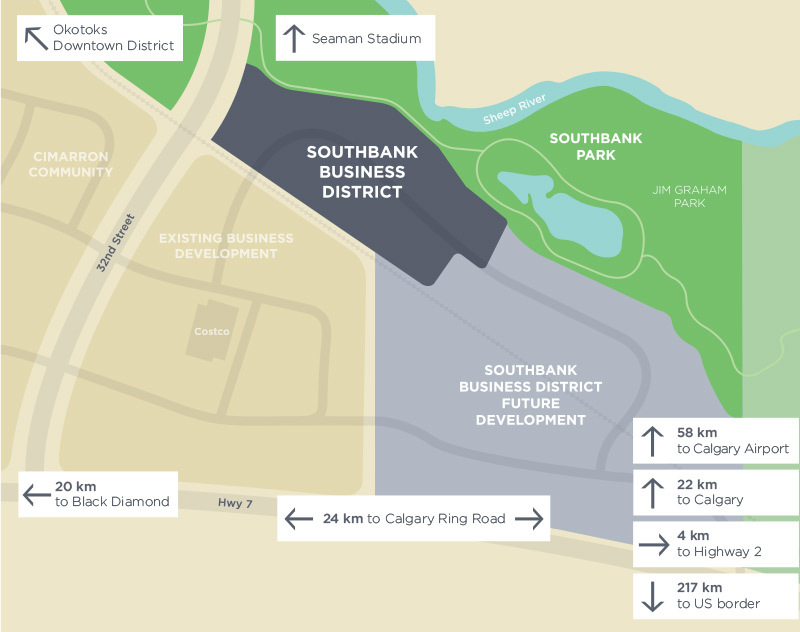 Southbank Business District is ideally situated within a 250,000+ person trading zone including the rapidly growing, young, prosperous town of Okotoks; nearby towns and hamlets; and ever-expanding south Calgary. Located here, you’ll be 15 minutes from Calgary with its 1.3M population, 132 head offices and core financial, resource, technology, and education concentrations. Locally, Southbank Business District is bordered by high traffic Highway 7 to the south and Okotoks’ recently upgraded 32nd Street to the east. 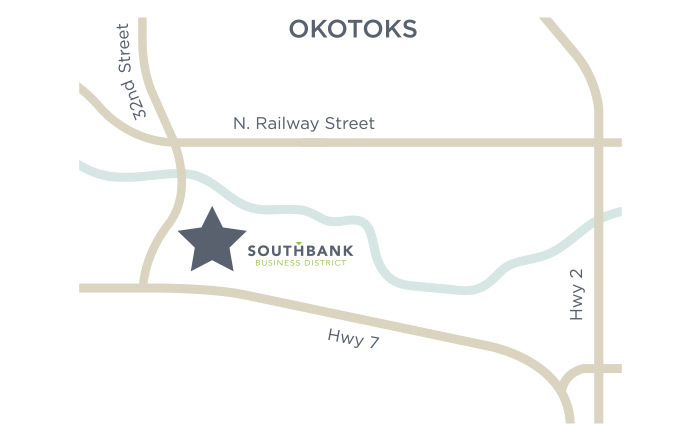 Southbank is within the Okotoks town limits and is in easy reach for to all Okotoks and surrounding community residents.